The Samsung GALAXY Note 2 has secretly screwed to the camera function by Samsung. This has changed a bit or you can say also improved. 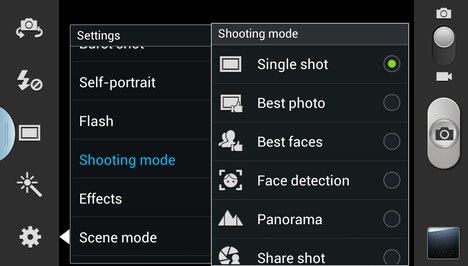 2 small changes were made ​​to the function of the camera of the Samsung GALAXY Note 2, the "Best Group Shot" has been renamed "Best Faces" and the burst mode has been revised. The Samsung GALAXY Note 2 has the same camera as the Samsung Galaxy S3. But with this Android - Smartphone, the South Koreans have been surreptitiously changed somewhat. Except the renaming and the burst mode of the camera is improved. Now it must be no more extra set, now it is possible to activate this by pressing and holding the shutter button of the Samsung GALAXY Note 2. This function is determined by the number of users already known HTC One X. This change is small, but very practical and should also in other Samsung smartphone firmware find their way! Well, there is nothing else on. On changes to the camera function I am curious if this function then also with Android 4.1 Update of the other Android - will keep smartphone models from South Korea catchment. Samsung has once again so "secretly" changed that. However, they should say so quietly, because the change is for me personally, absolutely, positively and improved just handling the camera a lot.